The dew point sensor is designed to continuously monitor compressed air. If the dew point is lower than set point the screen displays OK. If the dew point will rise above set level, device will display current measured value and there will be audio and visual signal. The alarm signl can be transferred to anywhere and with any means ordered, for example with built-in relay (potential free)or with RJ-45 to BMS system. 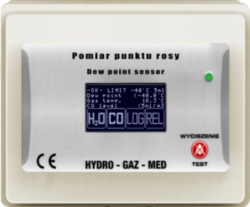 Looking for Dew Point Sensor ?